Why order takeout when you can make this sweet and spicy Teriyaki Sauce Recipe at home? Then you have the Teriyaki Sauce on-hand to use in stir-fry recipes, or as a marinade or sauce on grilled chicken, pork, beef, or fish! Scroll down to see the video about how to make Teriyaki Sauce. Teriyaki Sauce is more of a style of cooking in Japan rather than a sauce. You are not likely to find Chicken Teriyaki on a menu in Japan, but you will in Japanese restaurants in the U.S. 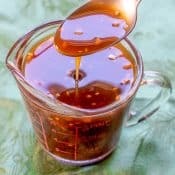 It is believed that Japanese immigrants to Hawaii created the sauce by combining soy sauce with local ingredients, like pineapple juice, to what has, over time, become known as Teriyaki Sauce. Today, the most common ingredients used to make Teriyaki Sauce are the following. Soy Sauce – I like to use the reduced sodium soy sauce so it does not make the food too salty. Brown Sugar – This is used to add sweetness to the Teriyaki Sauce. Minced Garlic – This adds flavor and a little spice. The ginger balances out the garlic nicely. Minced Ginger – I recommend using fresh ginger if you have it, otherwise you can use ground ginger. 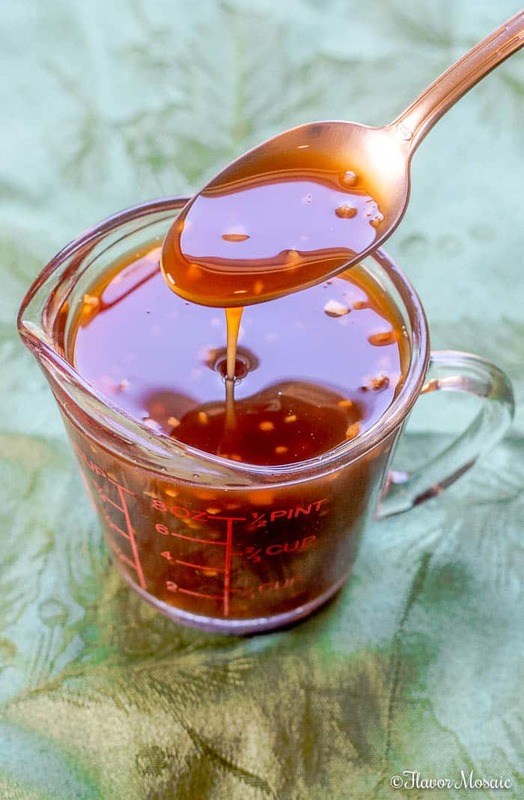 Honey – adds thickness and sweetness to the Teriyaki Sauce. Cornstarch – when mixed with water, this can be added to thicken the Teriyaki Sauce. Chef’s Knife – to use for smashing garlic, or chopping garlic or fresh ginger. Micrograter – to use to mince the fresh garlic or ginger. Measuring Spoons – to measure out the ingredients. Measuring Cup – to measure ingredients and can be used to pour out the teriyaki sauce. Saucepan – to heat the Teriyaki Sauce on the stove. Brush – to brush the Teriyaki Sauce on grilled or baked chicken, pork, beef, or fish. Carafe with Lid – to store and pour the Teriyaki Sauce. Making Teriyaki Sauce at home could not be any easier. It is faster than making a trip to the grocery store to buy store bought teriyaki sauce. Follow these simple instructions and you have teriyaki sauce on hand to use in your favorite recipes. Scroll down to see the video on how to make teriyaki sauce and scroll down further for the printable recipe card with the detailed instructions. Add soy sauce, brown sugar, garlic, and ginger to a saucepan over medium heat. In a small bowl mix the cornstarch and water until combined. Slowly stir in the mixture into the teriyaki sauce in the saucepan. Continue stirring until thickened. Remove the teriyaki sauce from the heat. Stir in honey. Store teriyaki sauce up to a week in the refrigerator. Watch the video above to see how to make your own homemade Teriyaki Sauce. Teriyaki Sauce can be used so many ways, it is limited only by your imagination. In addition, Teriyaki Sauce can be used as a marinade to marinate chicken or beef before grilling. It can also be used in stir-fry recipes, such as stir-fried chicken, stir-fried rice, etc. You can also use Teriyaki Sauce as a dipping sauce, or as an ingredient to create other sauces! It is so versatile, that it is fantastic to have on hand at all times. As mentioned, you can use Teriyaki Sauce is a variety of ways. 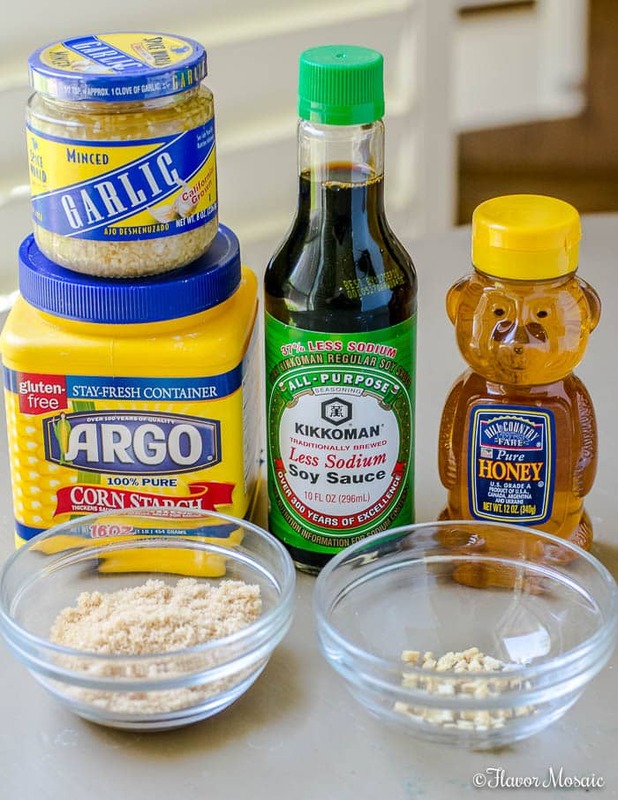 Below are some of my favorite recipes that use Teriyaki Sauce. 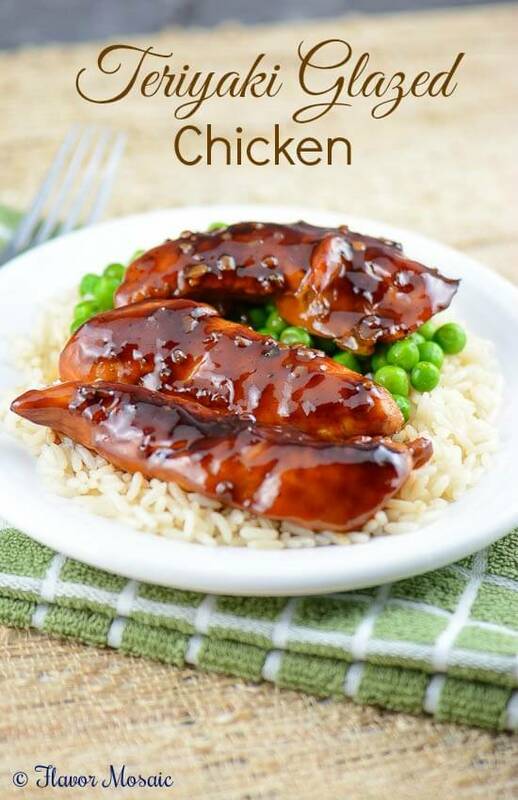 Teriyaki Glazed Chicken – an easy, delicious baked chicken dish with a sauce that perfectly balances the sweet, spicy, and salty Asian flavors. Teriyaki Chicken Stir Fry – is a fast, easy, healthy, and delicious Asian stir fry with chicken and vegetables in a flavorful teriyaki sauce that can be on the table in 20 minutes. It tastes so good that the whole family will love it! Teriyaki Rice Bowl – Tender garlicky chicken in a homemade teriyaki sauce with slightly crispy, fresh stir-fry vegetables served over a bowl of fluffy Basmati rice from the blog, Life Tastes Good. Chicken Teriyaki Burger – A delicious twist on the plain old burger! Asian flavors mixed right into the burger then basted with teriyaki sauce. Recipe from Renee’s Kitchen Adventures. 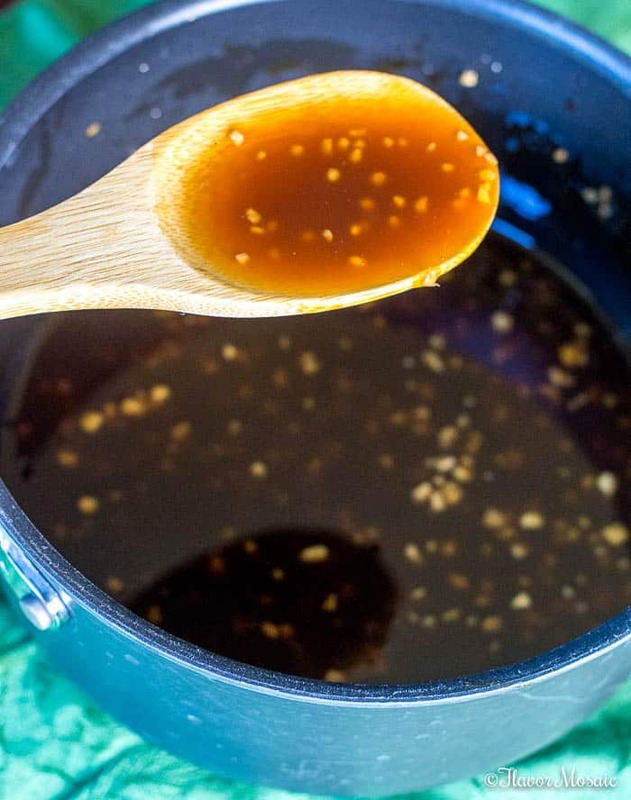 You now have all the information you need to make your own Teriyaki Sauce. So go ahead and give it a try and come back and let me know in the comments how you liked it. Why order takeout when you can make this sweet and spicy Teriyaki Sauce Recipe at home? Then you have the Teriyaki Sauce on-hand to use in stir-fry recipes, or as a marinade or sauce on grilled chicken, pork, beef, or fish! Add the first 5 ingredients in a medium saucepan over medium heat. Bring to a boil and reduce heat to simmer. In a small bowl, stir together the cornstarch and water. Stir into the teriyaki sauce. Remove from heat and stir in the honey. Use right away or refrigerate until ready to use.